The vyAkhyAnam for this thaniyan was divined by SrI piLLai lOkam jIyar. kaidhaisEr pUmpozhil sUzh….. – hasthigiri mahAthmyam says “ka ithi brahmaNO nAma thEna thathrAnchithO hari: I thasmAth kAnchIthi vikhyAthA purI puNya vivardhanI II” (“ka” is the name for brahmA. Since brahmA worshipped lord hari in this place, it came to be known as kAnchi. In such a famous place, on a lotus flower, in a lotus pond, this AzhwAr was born on the day of thiruvONam nakshathram (his birth-star is SravaNa). The thaniyan describes his birth and how his composition, the mudhal thiruvandhAdhi removed the darkness of ignorance from the world and allowed it to flourish. kaidhaisEr pUmpozhil sUzh kachchi nagar vandhu udhiththa poygaip pirAn – this describes the greatness of his birth. kaidhai (thAzhai) – a type of plant (screw-pine) which is found in watery places. Just as AzhwArs have sung in other prabandhams about this plant thAzhai (notably periya thirumozhi 1-3-10 “kaNdal vEli mangai vEndhan (kaNdal means thAzhai), thiruvAimozhi 4-10-8 “kokkalar thadam thAzhai vEli”) this plant is seen in abundance in watery places. pUmpozhil kachchi – periyAzhwAr in his periyAzhwAr thirumozhi 2-10-8 says “thAzhai thaNNAmbal poygai vAy”; nammAzhwAr in his thiruviruththam 26 says “am pum then iLam sOlai”, referring to the abundance of water in kAnchi. Thus this AzhwAr (poygai AzhwAr) reached the city of kachchi. kachchi nagar vandhu udhiththa – In the city of kachchi with abundant supply of water, in a pond full of water, just as there is a lotus [navel] in the divine stomach of emperumAn, this AzhwAr was born on a lotus, on the day of thiruvONam (SravaNa) star, in the month of aippasi (thulA). His birth is like the birth of brahmA on the lotus flower [of emperumAn]. poygaip pirAn – Since he was born in a pond (poygai), his name became poygaip pirAn. When sarasvathi tried to prevent the yagyam (ritual) of brahmA at thiruvehkA by flowing furiously as a river, emperumAn made himself as a dam to prevent the waters entering the yAgasAlai (the place of ritual) and thus made sarasvathi to flow underground. Hence this place is full of watery resources. poygaip pirAn – this AzhwAr became a benefactor [pirAn] to humankind, like an oasis in desert. As seen in iraNdAm thiruvandhAdhi 14 “thIrththa kararAmin thirindhu” this AzhwAr went about visiting various places to bring in sanctity to such places. kavigyar pOr ERu – a bull in the clan of poets. Leader among poets. Since he is the first among the mudhal AzhwArs (the first three AzhwArs), he is referred to as the first poet. Both nammAzhwAr (in his thiruvAimozhi 10-7-1 [senchoR kavikAL]) and thirumangai AzhwAr (in his periya thirumozhi 2-8-2 [senthamizh pAduvAr]) have praised him handsomely. He was referred to in the texts of ancient tamil vyAkhyAthas (commentators) as “this can be seen in the works of poygai AzhwAr”. Thus he became the leader among poets. piLLai lOkam jIyar (who has given commentary for this thaniyan) says further that poygai AzhwAr, who had such fame, composed with deep love, the great prabandham [mudhal thiruvandhAdhi] in order to enable the world full of SrIvaishNavas to flourish (vaiyaththu adiyavargaL vAzha arum thamizh nURRandhAdhi padi viLangach cheydhAn parindhu). vaiyaththu adiyavargaL vAzha– the SrIvaishNavas who live on earth. Such people are also called as sUris on earth (as opposed to nithyasUris who dwell in SrIvaikuNtam). The nithyasUris, also called by bhUdhaththAzhwAr in iraNdAm thiruvandhAdhi as “vAnaththaNiyamarar” are in any case flourishing. It is only for the SrIvaishNavas on earth that help is required for flourishing. How does this prabandham help them to flourish? It creates vaishNavaSrI (wealth of kainkaryam) to those who read it and practice it. Just as nammAzhwAr says in thiruvAimozhi 3-2-4 “nin thALiNaikkIzh vAzhchchi” (I can flourish only under your divine feet) – thus flourishing is realising one’s servitorship and carrying out kainkaryam accordingly. Another interpretation – merely reciting this prabandham is flourishing. arum thamizh nURRandhAdhi – this prabandham holds rare meanings within itself. It is composed in tamizh so that even common people can understand it [unlike samskritham which needs scholarly people to interpret it] and is neither too long nor too short as it has just 100 verses. Since it is in the form of andhAdhi [in an andhAdhi [antha + Adhi], the last word of one verse becomes the first word for the next], it is easy to commit to memory. vaiyaththu adiyavargaL vAzhavarum thamizh nURRandhAdhi – this prabandham has been composed to enable the SrIvaishNavas of this world to flourish. 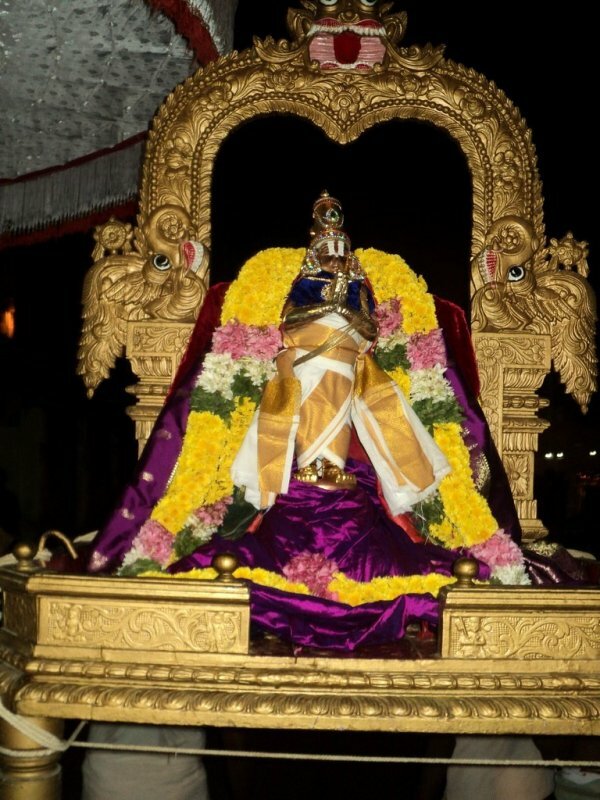 nURRandhAdhi padi viLangachch cheydhAn parindhu – from the first verse “vaiyam thagaLiyA” to the last verse “Oradiyum sAdudhaiththa”, the glow of this prabandham removes the darkness of ignorance in the world. rAmAnusa nURRanthAdhi 8 says “varuththum puRa iruL mARRa em poygaippirAn maRaiyin kuruththin poruLaiyum sem thamizhthannaiyum kUtti onRath thiriththanReriththa viLakku” (the glow that poygaip pirAn created by combining the meanings of vEdhas with the fineness of pristine thamizh language in order to remove the darkness of ignorance). padi – bhUmi (earth). viLangach cheydhAn – brightened it. Thus, poygai AzhwAr brightened earth with this prabandham. Another interpretation is: viLangum padi seydhAn – he made this work to remain on this earth forever. A third interpretation is: padi – analogy. He made this prabandham as an analogy to thiruvAimozhi which is considered as thamizh vEdham. A fourth interpretation is: padi – vigraham (thirumEni, the divine form of emperumAn); viLakkam – prakASam (brightness). poygai AzhwAr enabled the third AzhwAr (pEyAzhwAr) to locate the form of emperumAn in his mUnRam thiruvandhAdhi “thirukkaNdEn ponmEni kaNdEn” (I was able to witness the divine form of emperumAn with his divine consort). seydhAn parindhu – parindhu – with love. poygai AzhwAr composed this prabandham out of love for devotees of emperumAn who joined with him. As he himself said in the first pAsuram “seyya sudar AzhiyAnadikkE sUttinEn sol mAlai” he composed this pAsuram out of affection for emperumAn. The lamp glows out of affection. The prabandham glows out of affection. We shall next see the avathArikai for the prabandham. This entry was posted in iyaRpA, mudhal thiruvandhAdhi on June 4, 2017 by T N Krishnan.